Green Hills is a safe and friendly place where children can start developing their motor and social skills. We will help them explore and discover their academic interest. 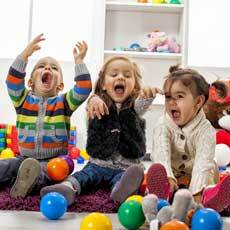 '¨'¨We are a Bilingual Preschool where children are exposed to both the English and Spanish languages. '¨'¨Children at Green Hills will develop the proper language skills and will build up a strong vocabulary in both languages. Our qualified teachers have the preparation and knowledge to help children become successful students. Our Curriculum is based on the Traditional Education System with the essence of the Montessori philosophy and our classroom environments are carefully set up to take advantage of both great methods of education. Teachers and staff at Green Hills will let children learn at their own pace, making sure that they always enjoy and feel comfortable in their school environment. We are sure you will enjoy being part of our school as much as we will enjoy working with your children.